Two Bears Farm and the Three Cubs: I've Heard of Blue Moons but Blue Eggs? I've Heard of Blue Moons but Blue Eggs? We have a new layer. Natasha, that weird looking chicken we have that sleeps in the trees. Paul says she looks mean. She's really not though. Imagine our surprise to find she lays a BLUE egg! We mostly have brown eggs. And Priscilla lays little white eggs. Buddha chicken lays the world's largest brown eggs that contain double yolks. But we never had a blue egg before! Elvis has yet to lay. I think he's been too busy working on the lyrics to a new song to lay any eggs. Blue Egg. You say me laying alone. Without a beaten egg heart. Without a Crockett of my own. 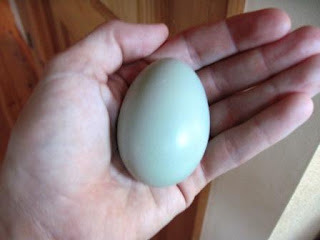 Blue egg. You knew just what I squawked for. You heard me clucking a prayer for. A rooster I really could care for. Well. He still has some work to do on that one. What a cool basket of eggs all these color must make! We had some chickens that laid blue, green and pink eggs when I was growing up. They are so cool. Awesome! You can make a nice Easter basket with those! Must be either Aracona or Americauna hen - they sell them in the catalogs as Easter Eggers - easier for the public to remember that way! One of my hens (Marilyn) is an Americauna - she has fluffy cheeks like the others of her breed. Aracona hens don't have a tail, per se - and they look more like a wild game bird! Lucky you - you won't have to color eggs in the spring!